Supermarket sales are continuing to grow at a healthy rate despite slowing after the summer high. New figures from Kantar Worldpanel, for the 12 weeks to 7 October 2018, show that supermarket sales overall grew 3.2 per cent compared to the same period last year, meaning they are above three per cent for the fourth period in a row and well ahead of the average market growth rate over the past five years of 1.7 per cent. Fraser McKevitt, head of retail and consumer insight at Kantar Worldpanel, said: “Consumer spending often slows in early autumn, after the excesses of summer barbeques and before the festive season kicks off. The arrival of colder weather and darker evenings has inspired consumers to embrace hearty comfort foods and stock up on Sunday roast staples." 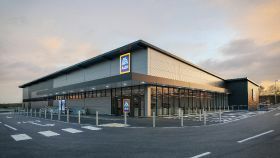 Over the quarter Aldi increased sales by 15.1 per cent, its fastest growth rate since January 2018, with its fresh and chilled aisles doing particularly well. Some six per cent of Aldi’s sales came from premium own-label lines including its Specially Selected range – a higher proportion than any other supermarket – and its growing number of stores helped it increase its market share by 0.8 percentage points to 7.6 per cent. Lidl attracted five per cent more shoppers through its doors compared with the same period last year and persuaded visitors to spend an extra 55p per trip – a greater increase than any of its rivals. Co-op, with sales up seven per cent, was the only other bricks-and-mortar retailer to gain market share, with shoppers particularly drawn to its own-label lines. Over the past 12 weeks sales at Tesco were up 0.9 per cent, but its market share fell by 0.6 percentage points to 27.4 per cent. “Despite widespread interest in the September launch of its discounter concept, Jack’s, the small number of stores planned means it won’t impact on Tesco’s market share without a significant expansion,” said McKevitt. Asda and Morrisons grew sales by 2.4 per cent over the period, while Sainsbury’s grew by 0.6 per cent.